The Earth Observation at high angular resolution is crucial for many applications. The CubeSat standard allows an easy and cheap mean to observe Earth, bringing a new paradigm to the Earth Observation. They are nevertheless limited by their small size which limits the aperture size of the telescope, thus the ground resolution to a maximum of 3 meters in visible wavelength due to the 10cm standardized size. UK-ATC is therefore developing a CubeSat named HighRes equipped with a deployable telescope. The telescope is composed of four independent segments of 9cm edge size, folded during the launch and able to deploy once in space. This telescope allows to reach a full pupil size of 30cm, and therefore a 1m resolution on the ground. The Cube-Sat is based on a 3U structure, with approximately 1.5U dedicated to the optics itself. The main issue on an optical point of view is to ensure the precise alignment of the segments with a precision of a fraction of the wavelength, typically a few tens of nanometers. This precision can not be reached by relying solely on the mechanical precision of the segment deployment. Any misalignment of the segments will create strong optical aberrations degrading the final imaging quality. The second issue stands in the optical aberrations caused by the deployment of the secondary mirror of the telescope, which is mechanically very hard and will create optical aberrations. These second kink of aberrations are quite different from the misalignment of segments which can ease the estimation of aberrations and their compensation. We present the strategy of wave-front sensing for the fine alignment of the deployable telescope. First the comparison of focal-plane methods able to measure the misalignment, namely focal-plane sharpening and phase diversity. 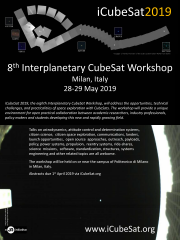 On a second point we present the strategy of calibration and operation of the deployable cube-sat to reach the final performance and ensure its stability during the observation.